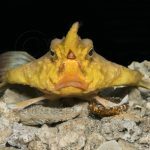 It’s mid October and it’s the most stressful day of the year for the aquarists at the Long Island Aquarium – as well as for a thousand or so of our favorite fishes. 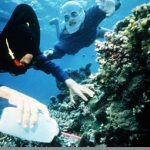 It’s the day we empty the outdoor snorkel tank for the season and move all of the fishes into other exhibits or to our off-site holding facility. What’s so stressful about that? Hmm…where to begin? For starters, we all have pretty busy schedules, so for the entire staff to take 4 or 5 hours out of our day for this annual event, it requires some planning and at least one late night at the aquarium. That’s not really so stressful though. We are always rearranging our schedules and we have a lot of late nights. Then there’s the logistics of how to catch all those fish. 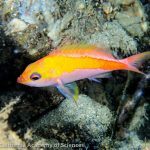 Some need to be scooped with buckets, some with dip nets, some need to be pulled by hand out of crevices in the artificial reef structure, some entire schools of fish need to be surrounded with a seine net. Most of the 80,000 gallons of water needs to be drained so we can get inside the tank and have a chance of catching them all. 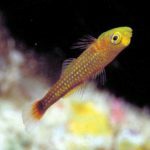 Of course there is a certain urgency once that happens, since all of those fishes are now swimming around in about one tenth of their tank volume with all filtration and circulation shut down and the cold, gray October day quickly cooling the water down. That’s not really so stressful either though. We’ve done this for seven years in a row now, so we have a bit of a system in place. For me, where the real stress comes in, is in trying to minimize damage to each fish we handle while still being able to finish the job in time to tend to our other responsibilities. It’s nearly impossible to handle any fish without doing some kind of damage. Whether it is damage to its skin, slime coat, fins, or even just the emotional damage of having the you-know-what scared out of it, each injury incurred opens the door to disease in the form of microbial infection or parasite infestation. This is not only because the first line of defense (skin or slime coat) is physically damaged, but because the next line of defense, the immune system becomes suppressed under stress. 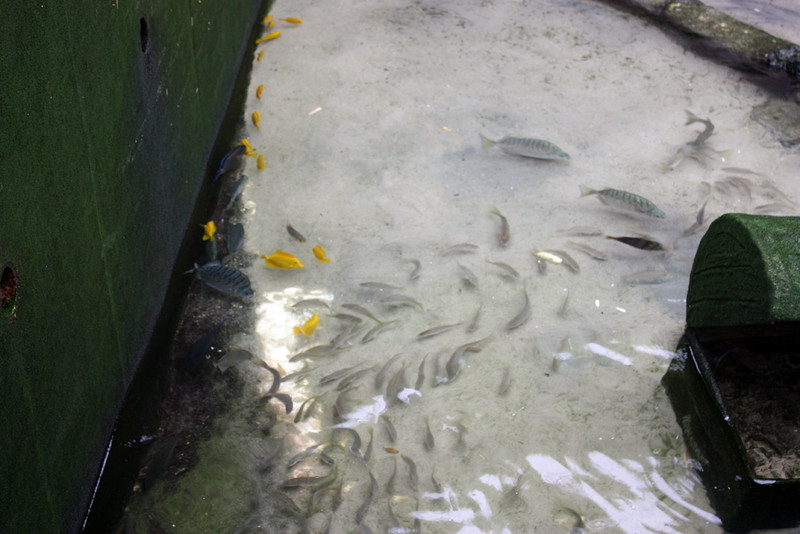 When this happens to hundreds or thousands of fishes at one time, the effect is greatly compounded by the fact that the large number of compromised fishes allow pathogenic organisms to become especially prolific within a system. This might be a good time to think about one of the many (albeit, lesser known) reasons for not stocking your new tank to capacity in one day; or about how environmental degradation, fishery by-catch, or even catch-and-release fishing can impact the health of entire fish populations. 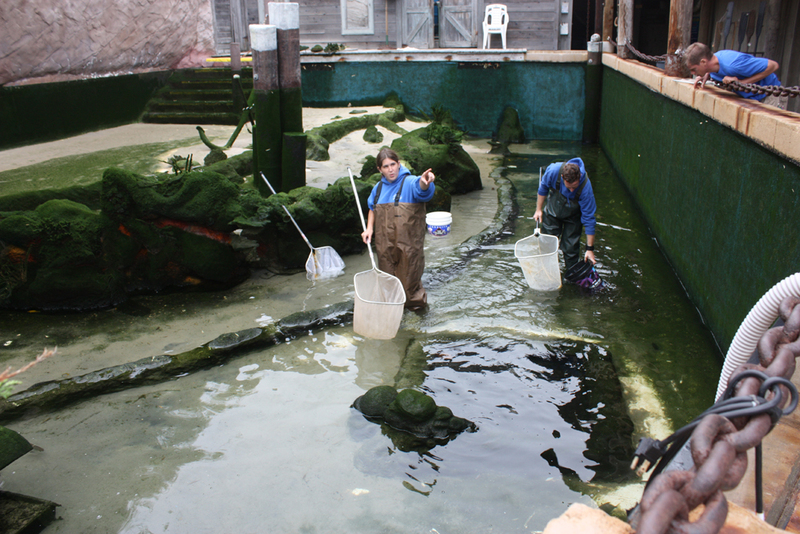 The Aquarists at the Long Island Aquarium draining the outdoor snorkel tank and moving all the fishes. Invariably, within a week or so of the move, some kind of disease breaks out in our holding facility. Fortunately, it is almost always something common, like Cryptocaryon, Amyloodinium, or some monogenetic trematode, with which we are well acquainted and are prepared to treat. I should mention that drain the snorkel tank day is not all stress and misery. It is kind of exciting getting a close-up look at these fishes after a summer of growth in this tank. I’m not sure whether it’s the overkill filtration (two 20-horsepower pumps running four giant high-rate sand filters plus three huge protein skimmers), the enormous volume, or the natural sunlight and associated algae growth, but fish really thrive in that system. Many of them have spent multiple summers in the tank. Today I pulled out an Atlantic blue tang that I caught in Shinnecock inlet 3 years ago. I can’t believe how much he’s grown! 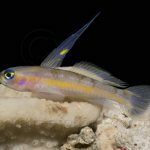 Another nice perk of this particular task is that while all of these fishes are growing, maturing, and dodging snorkelers over the course of a summer, many of them reach sexual maturity and begin to pair up. This day is a perfect opportunity for me to pick out pairs of fishes for my ever-growing broodstock system. Today I grabbed an assortment of damselfishes I’d like to try breeding, mostly Amblyglyphidodon species, but the catch of the day was a mated pair of blue ring angelfish, Pomacanthus annularis. I know they’ve never been raised before, and I have no idea where I’ll keep them once they are through with quarantine, but I’m certain that they have a larger egg size and shorter larval period than the basslets with which I am currently working, so really, how difficult can they be? Wow that is a monster task! The coordination in this operation has to be more difficult than you described. I would say next year post a help wanted thread here but then you would have to frisk people on the way out to make sure they didn’t have any livestock in their pockets LOL. Yes, there would be a lot of temptation…and some of those larger Pompano have some good looking fillets on them.